tvN’s Monday and Tuesday TV series Flower Boy Ramyun Shop (aka Cool Guys, Hot Raman) is a extremely popular drama which attracted fans from all over the world. One of the prominent landmark featured in the drama in the beautiful Eun Bi ramen restaurant opened by the lead characters, where many scenes and stories happened at the place. 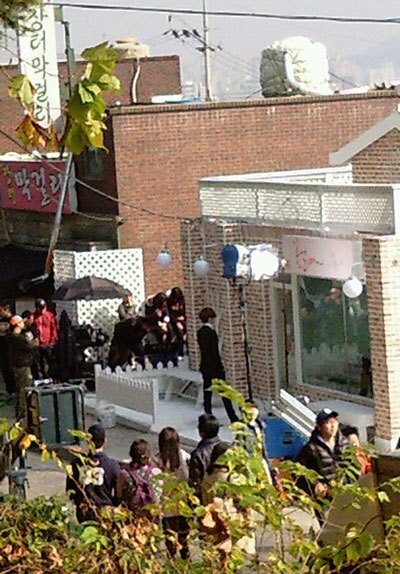 If you’re visiting South Korea, and would like to visit the filming set to meet the stars (do noted that filming ends mid December 2011), or simply to have some nostalgia of the drama in future, here’s the direction and guide on how to go to the actual shooting location of the raman shop in the Flower Boy Ramyun Shop drama series. The FBRS’s ramen restaurant is located near the Subong Park (수봉공원), Incheon. Specifically the building is located along the street of South Subong Road 24 Beong-Gil (수봉남로24번길). To go to the, take the Seoul Subway Line 1 towards Incheon direction. 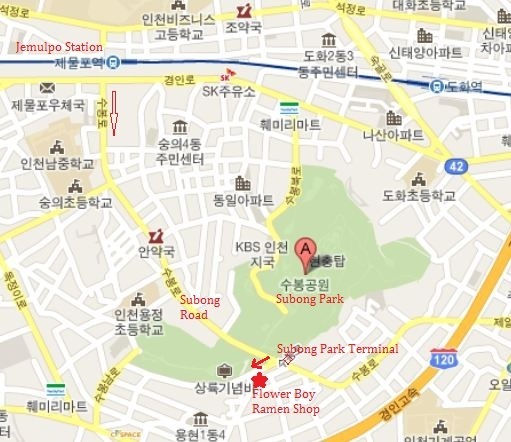 Alight at Jemulpo station (158), and head to Southern Square (남부 광장) to exit from the station from exit 1. Once outside, you will see the Subong Road (수봉로) to the right. From here, there are a few ways to get to the destination. Firstly, for people who is rushing of time, it’s possible to take a cab. Secondly, walk along Subong Road towards the direction of Subong Park (수봉공원), until arriving at the junction with South Subong Road 24 Beong-Gil. Walk into the street, and the ramen shop filming set is just ahead. Third alternative is by taking public bus 17-1 on the Subong Road, alighting at the Subong Park Terminal (수봉공원종점), after about 3 to 4 stops. The South Subong Road 24 Beong-Gil is just opposite the alighting point. The most obvious hint that you have hit the jackpot (find the right place) before the filming ends if large group of people will gather around the area. Anyway, the said bus above runs every 15 to 20 minutes and the bus route is looping, so to go back to the subway station, just board the bus at the same alighting point.